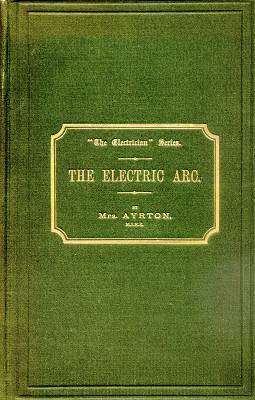 This book, which owes its origin to a series of articles published in The Electrician in 1895-6, has attained to its present proportions almost with the growth of an organic body. In experimenting on the arc, my aim was not so much to add to the large number of isolated facts that had already been discovered, as to form some idea of the bearing of these upon one another, and thus to arrive at a clear conception of what takes place in each part of the arc and carbons at every moment. The attempt to correlate all the known phenomena, and to bind them together into one consistent whole, led to the deduction of new facts, which, when duly tested by experiment, became parts of the growing body, and, themselves, opened up fresh questions, to be answered in their turn by experiment. Thus the subject grew and developed in what might almost be called a natural way. From the first it seemed to me that the fact that the resistance of the material in the gap between the carbons must not only depend upon the current, but that it must depend upon it in many apparently contradictory ways, could not but lead to curious complications in the relation between the P.D. and the current—quite apart from any back E.M.F. that the arc might possess. In the attempt to disentangle the various effects on this resistance that a change of current must produce, and to see how far all that was apparently mysterious in the arc might be the natural result of such complexity in the resistance of a portion of the circuit, the theory presented in Chapter XII gradually evolved itself. This theory, whatever may be its shortcomings, has at least not been hastily built up to fit a few of the more salient characteristics of the arc; it has literally evolved itself, during the course of a detailed study, from many points of view, of each separate phenomenon. For although the central idea, that the carbon vapour changed into mist at a short distance from the crater, occurred to me at a very early period of the work, its complete application to the whole series of phenomena, and the full recognition of all that it entailed, followed b slowly, as each part of the subject was considered. The experiments of other observers have been employed in two ways: (1) In confirmation of theory developed from my own experiments, and (2) as the basis of theory, for which further tests were devised. The law connecting P.D. current, and length of arc, for instance, was first constructed from my own results, and then was shown to be applicable to those obtained much earlier by Messrs. Edlund, Peukert, Cross and Shepard, and Ayrton. The theory concerning the light, on the other hand, was entirely deduced from the experiments of others. M. Blondel's interesting and systematic researches, the admirable work of Mr. Trotter, and Prof. Ayrton's Chicago Paper were all laid under contribution, and the deductions drawn from them were then tested by new experiments. Although the book is concerned entirely with the arc itself, and does not touch at all upon lamps and their devices, it is hoped that it may appeal to the practical man as well as to the physicist. For not only the cause but the practical bearing of each peculiarity of the arc has been considered; the directions in which improvements may be hoped for have been pointed out, and the conditions requisite to secure the maximum production of light from a given expenditure of power in the generator have been fully discussed.